Get Wonderstruck by Gray Whales – Whale-Watching Season is Here! Last Sunday, in the waters below the Point Reyes Lighthouse, a gray whale leaped out of the water to the delight of a dozen people watching from above. A moment like this is what inspired me to write Little Gray’s Great Migration. I saw a gray whale calf breach playfully again and again below the Point Reyes Lighthouse – and was wonderstruck. It is officially gray whale season all along the Pacific Coast, with southbound whales passing each day. This is the “southbound surge”; there will be another surge of northbound whales in mid-to late-March. Gray whales are wonderfully predictable in their migration patterns, so if the weather is going to be clear, head to the ocean! Read my tips for whale-watching at Point Reyes National Seashore, or if you’re elsewhere in California, Oregon, or Washington, check out my guidance for spotting gray whales all along the Pacific coast. I hope you are wonderstruck this season, too! For the past several months, thousands of gray whales have been traveling along the Pacific coast from their summer feeding grounds in Alaska to their winter breeding and calving grounds in Baja, Mexico – and then back again. Although the peak of the northbound migration along the central coast of California was mid- to late-March, it’s not too late to see gray whales. In fact, mid-May is one of the best times. That’s because right now, the gray whale mothers and calves are just passing places like Half Moon Bay, San Francisco, Point Reyes, and Bodega Head. Mothers and calves leave Mexico later than other whales and travel more slowly, so their migration schedule is about two months behind the schedule of most gray whales. Plus, mothers and calves travel much closer to the shore to try to avoid the orca whales and great white sharks lurking in deeper waters. This makes for fantastic viewing opportunities – no need for binoculars, even! Park officials at Point Reyes National Seashore say Mother’s Day is known as an excellent day for seeing gray whale mothers and calves. There is something incredibly special about seeing a gray whale mother and calf making their epic, 5000+ mile journey to Alaska. It’s what inspired me to write Little Gray’s Great Migration. So if the weather is good, head to the coast for a unique and fitting Mother’s Day activity! A pair of gray whales, mother and calf, passing Point Reyes Lighthouse on their northbound migration to Alaska. Photo by Louise Gregg. Tips for Whale Watching at Point Reyes National Seashore: Gray Whale Season Has Begun! Right now, thousands of gray whales are passing Point Reyes National Seashore on their way south to Baja, Mexico. In fact, mid-January is the peak of southbound gray whale traffic at Point Reyes. Check the webcam at the lighthouse before you leave your house. If it’s an incredibly windy or foggy day at the Point, whale watching can be nearly impossible. If it’s a weekend, be prepared to take the shuttle bus, as the road to the lighthouse will be closed to traffic. Add some time into your day for the shuttle, and bring adequate snacks. Be sure you’re visiting at the peak of the migration season. Besides the southbound surge in mid-January, there’s another surge of northbound whales in mid- to late-March. Mother’s Day is also known by Point Reyes park rangers as a great time to see lots of mothers and calves, as they travel north much later than the rest of the grays. Check out this graph of whale traffic patterns at Point Reyes. Whale watchers above Point Reyes Lighthouse. Whether you have a successful day spotting gray whales or not, you’re pretty much guaranteed a fantastic experience in Point Reyes assuming you packed plenty of windproof layers. The scenery is breathtaking, and if you’re at the Point between December and April for the whales, you get the added bonus of seeing hundreds of elephant seals from the Chimney Rock Overlook (the second stop on the shuttle bus). In fact, my insider tip is to be sure to walk down to the Historic Lifeboat Station (aka “The Boathouse”) after you go to the Chimney Rock Overlook. There are often a few elephant seals hauled out right near the Boathouse – the closest you will get to these incredible animals while in the park. And there’s hot chocolate and coffee served in the Boathouse on the weekends from 11AM - 4PM during the winter season. Directions for how to make your own whale origami (I added some barnacles to mine to really make it look like a gray whale). The interactive online game Whale Watcher where you join Jean-Michel Cousteau’s team in filming gray whales on their migration. A gray whale crossword puzzle from the American Cetacean Society. A Little Gray’s Great Migration printable word search. A Little Gray’s Great Migration online jigsaw puzzle. “What are some reasons an animal might migrate?” I asked a class of third graders at the beginning of a recent whale talk for Little Gray’s Great Migration. Several hands shot up. I called on a girl who was practically jumping out of her seat. “Because humans are destroying their habitat so they have to leave,” said the girl, her eyes wide. “Yeah, there’s too much pollution!” chimed in the boy next to her. I’ve had many experiences like this: I’ll ask kids a question and the first responses I get are about habitat destruction and pollution. It’s fantastic that kids today are so aware of the state of our environment; their deep worries and passion for the planet give me a lot of hope. But of course it’s also incredibly sad that learning about nature and wildlife as a kid these days means you have to talk about a lot of dark stuff. That’s why I always share with kids some ways they can directly help make things better for gray whales and the ocean they live in every day. Saving energy and resources. This includes turning the lights off when you’re not in the room, recycling, and walking or riding your bike more often to get places. All these actions help fight climate change – the biggest threat to gray whales. As ocean waters get warmer from climate change, they sustain less amphipods, which is the main food source of gray whales. Picking up litter on the sidewalk and beach. This keeps trash out of the ocean so marine animals don’t accidentally eat it and get sick, or get hurt from trash tangled around their bodies. Don’t miss International Coastal Cleanup Day in September, too. Being sure your family buys and eats only seafood that is certified as sustainable. The Monterey Bay Aquarium’s Seafood Watch guide helps you choose seafood that's fished or farmed in ways that protect sea life and habitats. Gray whales spend most of the summer (~June through ~September) in the Bering Sea and the Chukchi Sea. In the summer, the combination of lots of sunshine and melting ice support tons of phytoplankton that grows, dies, and then feeds the whales #1 food: amphipods. Gray whales will eat about 65,000 pounds of amphipods during the summer. Gray whales spend a few weeks (sometimes longer, especially new mothers and calves) in the lagoons of Baja, Mexico starting in December through February (longer for new mothers and calves). These warm, protected waters are the breeding and birthing grounds for the whales. Cabrillo National Monument in San Diego is a well-known spot for viewing southbound gray whales (though not northbound) from mid-December through March. In Los Angeles, southbound gray whales pass starting in mid- to late-December, with the peak of northbound gray whales generally in early to mid-March. Check out the Los Angeles Chapter of the America Cetacean Society’s annual census. The peak of gray whales passing Point Reyes going southbound starts in December and peaks in mid-January. There’s another surge of northbound whales in mid- to late-March. However, Mother’s Day is known by park rangers at Point Reyes as a great time to see lots of mothers and calves, as they travel north much later than the rest of the grays. Up in Oregon, whale watchers see grays head south in early December and return north in late March to early April. The most helpful book I’ve found for gray whale watching is The Oceanic Society Field Guide to the Gray Whale. It lists all the best viewing spots along the entire west coast. Here are answers to some of the most frequent questions I get about my journey as a writer as well as how Little Gray's Great Migration became a book. Well, back in elementary school I was designing book covers for stories I’d written in the hopes that someday I would be a published author (see below). So I’ve been interested in writing for a long time! The thing is, I think that if you love reading, you really can’t help but get into writing. Just like I think that if you love animals and nature, you really can’t help but want to protect the environment. What is the most frequently asked question you encounter as an author and what is your answer? This is such a hard question to answer! There are so many weird, funny, surprising, inspiring, unbelievable, and amazing things – especially in nature – that you could write about that would make for great stories. There aren’t enough hours in the day to explore all the possibilities or you would never have time to actually write. So I like to pick things that I either have a personal connection to in some way or I simply can’t stop thinking about. The idea for Little Gray’s Great Migration was both. I’d fallen in love with gray whales and whale watching, and then had this idea (from my husband) for a story about a gray whale calf. The next thing I knew, I was reading everything I could about gray whales to where it became an obsession. All that research helped the story develop even more in my mind and there was no turning back from following Little Gray on his migration. I’m my most creative when I’m either bored or out in nature. Being bored is great, because it opens up space in your brain for new ideas. So the next time you’re bored, think of it as a chance to come up with a really cool story or an art project or a dance or make up a game or whatever you like to do. When I’m out in nature taking a hike or camping, it opens up space in my brain in the same way. I also think fresh air and quiet are essential ingredients for creative writing, which nature of course has lots of both. What is most rewarding and/or challenging about writing children’s books? Writing for kids is an awesome challenge, because you have to make your story super engaging and super short at the same time. My first draft of Little Gray’s Great Migration was really long: I put so many details and so much science in there. I couldn’t help it! I’d been researching gray whales like crazy and there were so many fascinating things about them I felt I needed to share with readers. But as I started seriously editing and cutting Little Gray’s Great Migration, the heart of the story surfaced – and the whole thing got much stronger. At the end of the day, you have to write a story where the reader really wants to know what happens next. Then hopefully they’re inspired to learn even more. I've been writing books since I was a kid. Little Gray's Great Migration is my first published book. The journey from the idea for Little Gray's Great Migration to it *actually* being a book in bookstores has been a long one, a little bit like Little Gray's journey from Mexico to Alaska. I wrote the first draft exactly five years ago! I'm so grateful to the Marine Mammal Center for stocking the book already as well. The book is available at Point Reyes Books and will soon be at all the bookstores at Point Reyes National Seashore, too. I'll keep updating this page as I work with more booksellers, aquariums, and gift shops to stock Little Gray. If you have any ideas of places that seem like a perfect home for Little Gray, please contact me! In the meantime, you can order the book through your local independent bookseller (find one here) or at any online retailer. 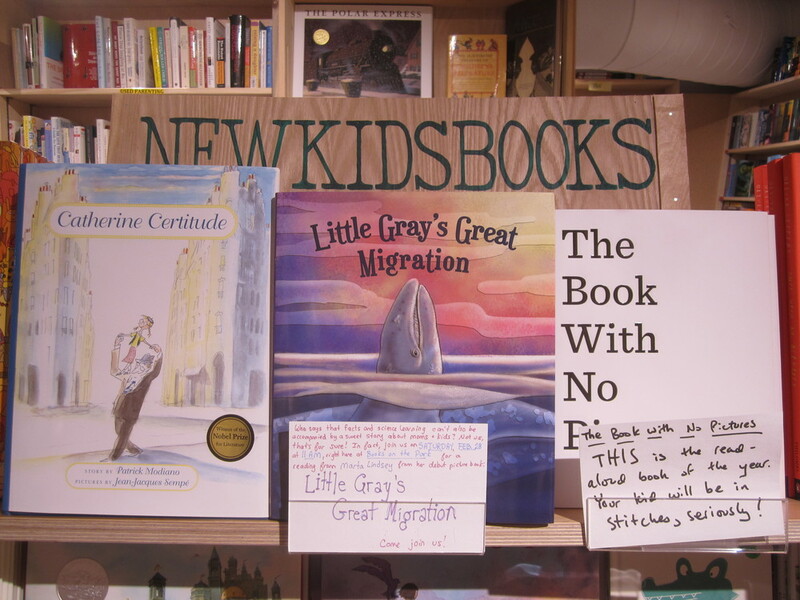 Little Gray's Great Migration on the shelves at Green Apple Books on the Park.